After his senior year in high school in Deerfield Beach, FL, Denard Xavier Robinson was an accomplished three-year starter at quarterback. He could run the 40-yard dash in 4.32 seconds. He completed 262 of 576 passes for 4,784 yards and 44 touchdowns. He also ran 217 times for 1,132 yards and 13 touchdowns. Rivals listed him as a 4-star prospect, one of the top 250 high school players in the country. They ranked him the #35 prospect in the state of Florida, 188th overall, and the 8th best athlete in the class of 2009. No publication listed Denard as a quarterback, however. In fact, Scout listed him as an athlete as well, but also ranked him the #16 cornerback prospect. He was recruited by such schools as Auburn, Florida, Georgia, Kansas St, Miami (FL), Ohio State and UCF. He held offers from all of them – but each offer had a disclaimer. No one wanted him to play quarterback. Each of those schools wanted him to play receiver. But one school didn't. Rich Rodriguez and his staff began recruiting Denard Robinson while he was still coach at West Virginia. Denard fit the mold of the RichRod-style spread-option QB perfectly. The mold was cast from Pat White, the famed Mountaineer quarterback who defined Rodriguez's career at WVU. When Rich and OC Calvin Magee moved on to coach at Michigan, it was painfully obvious in 2008 when they tried to salvage a season with Steven Threat and Nick Sheridan, that they needed a much better athlete to run their offense. They had no problem selling Denard Robinson on Michigan because they were the only ones that wanted him to play quarterback – and so did Denard. Badly. So Michigan won out. In 2009, Denard split playing-time with fellow true-freshman Tate Forcier. Forcier could not match Robinson in skill level, but made up for that with a little something called 'moxie'. Perhaps no QB in Michigan history could claim to have made more out of less than Tate Forcier. At times, he could put on quite a show. I'll never forget how he played against Notre Dame that season. Only to contrast that with how he played against Ohio State 10 weeks later. He had a decent arm and could scramble pretty well. But he made a lot of freshman mistakes, and had a tough time recovering from them. He had moxie, but it ran out pretty fast. And when it was gone, it was painfully obvious there was little else there. Denard was the backup all year. He only played when Tate struggled...which was often. But Denard struggled just as much. He could run and scramble with the best of them, but his arm needed a lot of work and he didn't know the offense as well as Tate did. So much so that most of the time, defenses knew that when Denard was in the game, he was going to just take the snap and run. They could just stack 8 or 9 in the box and three-and-outs would typically result. Between 2009 and 2010, Robinson took it upon himself to improve his passing ability. He knew that throwing ability was the only thing holding back from the starting spot. While Forcier slacked off that off-season, Robinson went to work. And in the opener against UConn that next season, Robinson replaced Forcier as the starter, and never looked back. The 2010 season was a fruitful mix of highs and lows, much like 2009. A thrilling victory over Notre Dame and an undefeated streak against non-conference opponents got Michigan fans excited once again. But losses to Michigan State, Ohio State and struggles against Big Ten opponents made everyone question the leadership of the program. Denard showed significant progress from 09 to 10. His passing stats were on par for any Michigan quarterback, and his rushing stats were on par for any Michigan running back. He showed substantial improvement in just one season. He showed that he could, one day, become the leader of this offense. He actually finished 6th in Heisman Trophy voting that year. But he got dinged up quite a bit. He paid dearly for his 1700 rushing yards with multiple injuries. Yes, he was a phenomenal athlete, but what good was that if he kept getting injured? 2011 started out with a lot of uncertainty. Gone was Rich Rodriguez, the primary reason Denard came to Michigan in the first place. Gone was the spread-option offense which fit Denard's ability so well. The time between Rich Rod being fired and his successor being hired was filled with a lot of speculation about a lot of things. Aside from who would be the next coach, many wondered if that next coach would run an offense that featured Denard Robinson at quarterback. Not only that, but would Denard even want to stick around to find out. There's no doubt he could find another school that would want him to plat quarterback. When Brady Hoke was hired, one of the first people he met with on campus that snowy January day was Denard Robinson. Whatever was said in that room was obviously enough to persuade Denard to stay. You could say Denard was Hoke's first recruit, really. Hoke and his staff knew having a returning starting QB was better than not having a returning starting QB, regardless of schematically how well he fit in. No question, that decision was a pivotal one for both Denard and Team 132. I have no doubt this team wouldn't get to 11 wins without Denard. The 2011 season was a step back for Denard, statistically. While the Wolverines improved in almost every area, especially the running game, Denard took a step back. But that wasn't really his fault. He wasn't asked to do as much – which is a blessing in some ways because it probably kept him on the field more than in 2010. Offensive coordinator Al Borges, who is known for running a more pro-style offense, was asked to adapt his schemes to take advantage of the unique ability of Denard Robinson. How refreshing to have a coaching staff willing to adapt to the talent in-hand? Shocking, I know. As Denard approaches his senior year at Michigan, his 3rd as a starter, speculation naturally emerges about his professional prospects. Everyone seems to agree that he's a special college quarterback. But is he an NFL-level quarterback? ESPN NFL draft analyst Mel Kiper doesn't think so. "At the end of the day, you don't know where Robinson is going to fit in. I say wide receiver because it has happened a number of times in the past to allow you to think that could happen. He may also be a defensive back. One of those two spots, otherwise he's not going to play in the NFL. "If he can't play wide receiver, slot receiver and return man and if he can't play in the secondary then all he is is a wildcat quarterback, which doesn't bring a lot of value." Kiper currently has Denard listed as the 5th best receiver on his 2013 draft board. Mind you, Denard has never played receiver, slot or otherwise...ever. But all of the praise he receives speaks to his outstanding ability to make plays. No question his speed and elusiveness have value at the next level. But the bigger part of it is, experts can all see Denard is a great football player, but no one is sold on him playing quarterback at the next level. "You know he's going to be a great college quarterback and at the end of the day we'll see what he can do either during the college all-star games or the NFL combine or his pro day to see if he can do other things," Kiper Jr. said. "It's wait and see." I have to agree with Kiper here. And while he might say it's a 'wait and see', what he really means is it's foregone. NFL scouts see a shifty, fast playmaker with amazing collegiate talent...who's short and has a mediocre arm – not the desired NFL QB pedigree. I have no doubt Denard Robinson will end up on an NFL roster. But I can almost guarantee it won't be as a quarterback, unless he can absolutely prove everyone wrong in his last season in Ann Arbor. So while the NFL will have to wait another year for Denard, Michigan fans get one last season to watch him work his magic. Hopes are high, of course. Hopes should always be high for any Michigan senior quarterback. ESPN Big Ten blogger Brian Bennett has ranked Denard the 6th best overall player in the league going into 2012, and #1 QB. No other Big Ten QB even made his top 10. There might not be a more exciting player in the country than "Shoelace," who's put together more heroics than a comic-book character the past two seasons. But his passing remains suspect, as evidenced by his Big Ten-worst 15 interceptions last season. The word out of spring practice was that Robinson had improved his fundamentals and looked sharp as a passer. If he can add accuracy to his other many talents, the sky is the limit for him and the Wolverines this season. Seems like everyone wants to heap praise, but will immediately disclaim it by using the 'high risk vs high reward' argument. 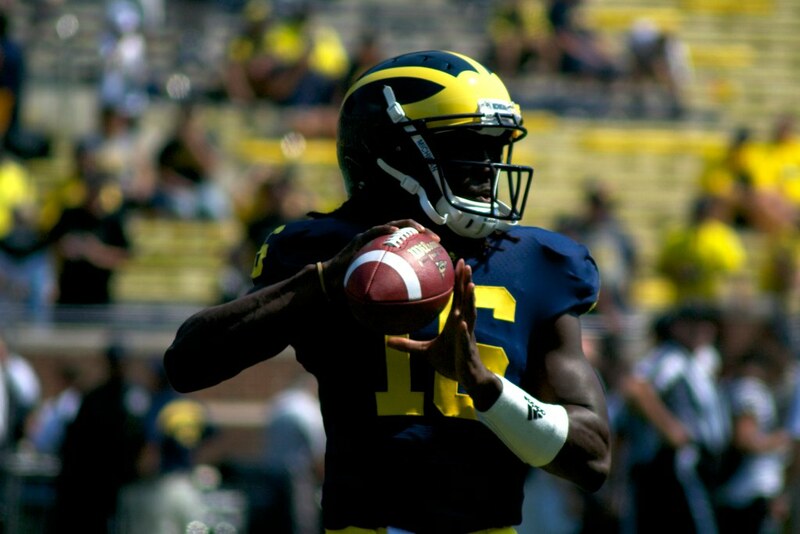 You hear a lot of "Yes, he's an amazing talent...but..." "Yes, he's exciting to watch...but..." Yes, he's a great college quarterback...but..."
Denard Robinson is a senior quarterback for the Michigan Wolverines. I'm still trying to wrap my brain around that fact. Once he's gone, a return to the big-arm pro-style quarterback is all but assured. And while there's nothing wrong with that, it won't be the same, not even close. Denard's star burns a little brighter than we're used to at Michigan. So, for one more season, enjoy what could be one of the most dynamic athletes to ever wear the winged helmet. A player like this may never come along again for Michigan. Let that be the legacy of Shoelace.